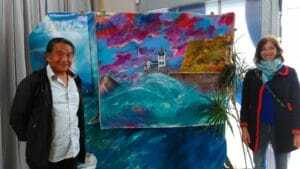 Mayumi Tsubokura is a Japanese painter influenced by both the ocean and Polynesian culture. Between 20th and 28th May, he’ll be exhibiting at La Grande Plage in Biarritz. After that, he’ll be exhibiting at your favourite place… Nami House ! He might be the most Basque person among Japanese people… He has had multiple lives : from surfer on the North Shore of Oahu, Hawaï, to painter, he met during his life all the surfing legends: king Kelly Slater, Gerry Lopez, Laird Hamilton, Miki Dora, to name just a few. 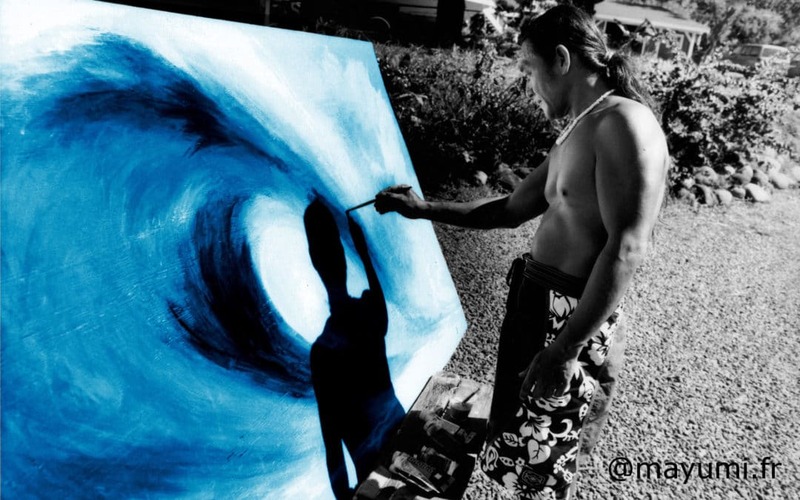 We meet Mayumi at his « local office » – Surfrider Foundation headquarters in Biarritz – where he paints nowadays. We arrive at the car park in front of the building and see a guy painting a massive wave outside. Mayumi doesn’t see us at first : he has his back turned with his headphones on, certainly to focus on his painting, to be in « the zone ». When he sees us, he turns with a gentle smile. We can see he knows how to make you feel comfortable : there is not that kind of distance you may feel sometimes with Japanese people… You can tell he left Japan a long time ago. 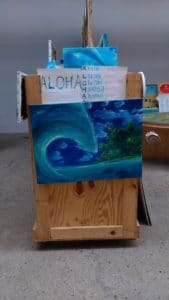 As soon as we move inside to see his work, Mayumi starts talking about where he comes from, explaining the meaning of the Aloha spirit, detailing all Hawaiian legends he tells through his painting. He talks about the thousand people he has met during his life. His thoughts go in many directions and sometimes it’s a bit hard to follow… But still, there is a link between all the stories he tells us. She comes from 9600 miles. Hawaiian coast is her last breath. She’s got two lives: she goes left and right. You can never kill it. One foot or thirty feet, she’s a dragon. On arrival in Hawaii back in the 70’s at the age of 19, he goes directly to Waikiki beach, drops off his luggage, rents a surfboard and starts paddling into the ocean. Not yet used to big waves, he starts drowning until a hand pulls him out of the water, puts him back on his board and screams : « paddle, paddle ! ». No longer knowing where he is, Mayumi just keeps on paddling until the guy screams : « stop ! ». He has a look in front of him and sees the massive face of a wave below him. He’s sitting on top of it. Right then, the guy that just saved his life starts screaming again : « Now ! Paddle ! Paddle ! ». That was the first big drop of Mayumi’s life, at Waikiki beach in Hawaï. The guy who saved his life is a certain Rabbit Kekaï and was about to change his life forever. A few years later he gets his revenge by being part of the surfing crew on the North shore of Oahu. That’s where all the most famous waves break : Pipeline, Backdoor, Sunset Beach, Waimea bay. 30 minutes later we all arrive at Nami House. 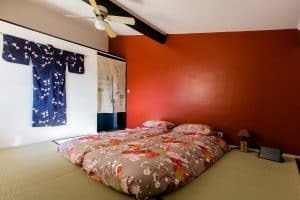 We introduce our new friends to Amami room : our Japanese-style double room with tatami mats covering the floor and traditional futon mattresses. Mayumi takes a deep breath and says – his Japanese roots speaking : « I love that fresh smell of brand new futon ». Once we finish the visit, they join us downstairs in the Hawaiian-style lounge to share a Gen Mai Cha (Japanese tea). Once again, the conversation is jumping in all directions : from Shintoism, to Buddhism and Zen word meaning, then the Reunion Island slave trade (NDLR : Justine comes from this small idyllic island of the Indian Ocean). Mayumi’s stories are so incredible that sometimes it’s hard to tell if they are 100% true… What is for sure, is that he has lived a hundred lives. For a few years now, he has been living in Biarritz. During May 20-28, he’ll be exhibiting at La Grande Plage in Biarritz upon the ISA World Surfing Games. Then ? He’ll be exhibiting at your favourite place… Nami House ! To know when the exhibition starts, follow us on Facebook and Instagram. To learn more about Mayumi’s beautiful work : click here.